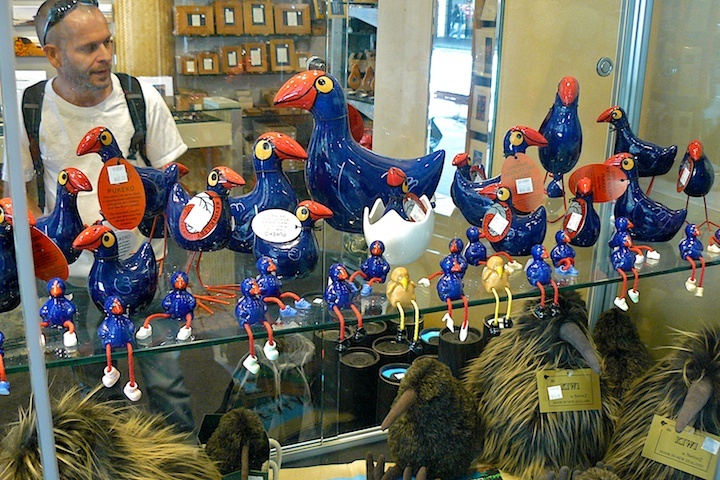 This great gathering of all manner of pukeko was seen in the shop window of “From N to Z — Classic Kiwi Culture”, at 75 Queen Street. The pukeko (porphyrio porphyrio) is a swamp hen native to New Zealand. Just for fun I looked up the collective nouns for birds … now for these to be a gaggle they would have to be geese. I’m pretty sure pukeko is a water hen they are a brood … Ok those cheerful little guys look much more like a gaggle. I wonder if these pukekos are made by the same artist at Mt Albert. i drove past once, and I had to stop to take photos of the Giant on the roof.